Few Americans who aren’t from New Orleans get to fully appreciate the wonders of Vietnamese food. The complex flavors present in ph?, or the delicate eggy texture of the Vietnamese crepe are mostly lost on the rest of the country, but not here. Since the 1970’s, with the boom of Vietnamese immigration to New Orleans, we’ve seen restaurants that serve traditional Vietnamese fare popping up in every corner of the city, from New Orleans East, to the Westbank, to Uptown. With that, Vietnamese fusion has become ubiquitous in the city, and you’ll often find samplings of Vietnamese flavors on menus that don’t even promote themselves as being Vietnamese. One such item that gets adapted and changed often is the bánh mì, a Vietnamese sandwich that typically is one small loaf of bread that is similar to French bread, stuffed with grilled meats, pate, pickled vegetables, and fresh herbs. The sandwich became extremely popular in New Orleans due to its similarity to the city’s classic “po’boy” and is often referred to as the “Vietnamese Po’boy” around New Orleans. I’ve altered the bánh mì here by replacing the bun with cornbread waffles, and instead of grilled beef, I’ve charred some pork belly. It comes together to give you something that tastes kind of like a pork version of chicken and waffles but with some strikingly Vietnamese flavors from the soy sauce, fish sauce, and rice wine vinegar. Make as sliders for a party, or an easy but unique dinner. In a medium bowl, whisk together the fish sauce, soy sauce, 1 Tablespoon of rice wine vinegar, chopped cilantro, red pepper flakes, and dark brown sugar. Add the sliced pork belly and evenly coat in the marinade. Cover in plastic wrap and refrigerate for half an hour, or up to overnight. In a separate bowl or mason jar, whisk together the cup of rice wine vinegar and the white sugar until the sugar is dissolved. Add the sliced carrots and turnip and cover with plastic wrap (or lid if you use a jar) and refrigerate for half an hour, or up to two weeks. To cook the pork belly, turn your oven broiler to high and bring a skillet on your stove top to medium-high heat. Sear the slices of pork belly on each side for two minutes before placing the skillet under the broiler for about 8 minutes. Watch closely as the belly will cook slower or faster depending on how thick you've cut it. It should have a nice brown caramelized color once it's done. Preheat waffle maker to medium heat and grease with a drizzle of olive oil. In a medium bowl, mix together the corn flour, oat flour, baking powder, and salt. In a separate, smaller bowl, whisk the egg. Whisk in the honey, yogurt, and olive oil until combined. Pour the egg mixture into the flour mixture and stir until it all is just coming together, being careful not to overwork the batter. Let sit at room temperature for about 7 minutes. Using a spoon, scoop half of the batter onto the waffle maker and gently spread until even. Cook until golden brown (about 4 - 5 minutes for most standard waffle irons). Remove from the waffle maker and repeat for the next waffle. Set cooked waffles aside and let cool slightly before cutting into 4 even triangles. 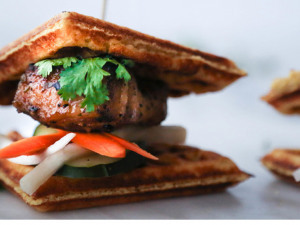 Once your pork belly and waffles are ready, assemble the sandwiches by layering the carrots and turnip on one waffle triangle, followed by the pork belly and any garnishes (cucumber, jalapeno, cilantro). Top with another fourth of the waffle and pin it all together with a toothpick! 1 large carrot, sliced into thin strips. 1 large white turnip sliced into thin strips. The recipe for the waffle portion of this dish was adapted from Ashley over at Edible Perspective. Check out more amazing recipes from Beau at his website probablythis.com. 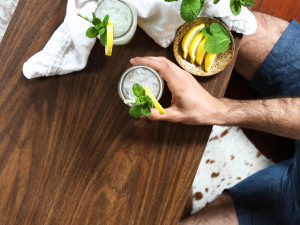 Follow him on Instagram, Twitter and Facebook for frequent updates on new recipes.